The Between the Flags (BTF) system is a 'safety net' for patients who are cared for in NSW public hospitals and health care facilities. It is designed to protect these patients from deteriorating unnoticed and to ensure they receive appropriate care if they do. The Clinical Excellence Commission (CEC) hopes that readers will find the information and resources provided through this website useful in developing or advocating for safety nets like BTF, to protect patients in other health services. As in health systems around the world, patients in the NSW public health system can deteriorate unrecognised and without an adequate response. Between the Flags addresses this problem by acknowledging that early recognition of deterioration can reduce harm to patients and the earlier the better. This idea comes from the pioneering work of Prof Ken Hillman, who developed a simple, but innovative system at Liverpool Hospital, NSW in the late 1980s. It was designed to identify patients who were deteriorating. It consisted of establishing vital sign thresholds (calling criteria) for escalation and a clinical response team with advanced life support skills. It was called the Medical Emergency Team (MET). This original work by Prof Hillman and his colleagues gave rise to an international collaboration around the development of such systems. They are now common in Australia, the UK, the US and Europe. Between the Flags was introduced in NSW in January 2010, in response to Recommendation 91 of the Special Commission of Inquiry: Acute Care Services in NSW Public Hospitals, chaired by Peter Garling SC (published November 2008). The Inquiry strongly recommended that a Statewide system for improvingrecognition and response to deteriorating patients be implemented across NSW. This was based on the findings of a CEC pilot project which had further developed Prof Hillman's ideas in four hospitals in NSW. The challenge presented by Recommendation 91 was to implement such a system in over 200 facilitiesin the State. The CEC took on the challenge, in partnership with the then Department of Health for NSW, the area health services and clinicians and managers across the State. 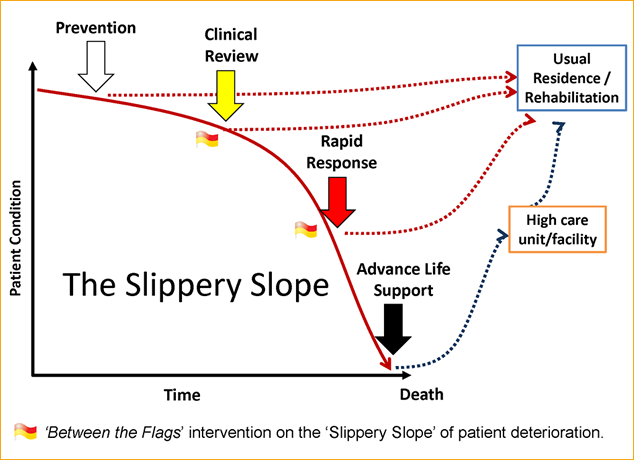 The Slippery Slope diagram shows how the BTF system is designed to intervene in the process of patient deterioration with two key interventions, namely Clinical Review and Rapid Response. BTF introduced an intervention even earlier than the traditional clinical review, by the home team. It mandates the availability of this and a Rapid Response (equivalent to the MET) in all hospitals and facilities across the state. BTF is designed as series of interventions that act synergistically. Governance is listed first, in recognition of its pivotal importance. The program relies on leadership and governance by individuals whose roles and responsibilities are clear. Standard calling criteria, incorporated into a standard observation chart, grafts the BTF system into the fundamental clinical practice of taking and recording vital sign observations. Universal clinical emergency response systems with minimum standards, education on recognition and response to deteriorating patients complete the safety net. Evaluation providesfeedback and lessons learned for improvement. Between the Flags has provided a foundation on which to build improved patient safety and quality systems in NSW. For example, Sepsis Kills and REACH build on BTF. The logic of the Slippery Slope compels one to not only try to develop safety nets like BTF, but to develop systems that prevent patients from going down the Slippery Slope in the first place. One way of doing this, is through building high-reliability patient care teams focused on patient-based care. Teams that deliver better overall performance through good leadership, and optimal team work. A program called In Safe Hands is being trialled in development sites. It aims to deliver high-reliability patient care teams across NSW. The CEC, in partnership with the local health districts, is evaluating the impact of BTF on NSW hospitals. Together with the University of New South Wales, there is also an opportunity to further investigate the impact of culture on the implementation of the program.